Over/Under: Under 149.0 at 1.90 Bet Now! Both of these teams are still waiting on their first win after losing out in their opening games but the mood and expectation in both camps is likely to be quite different. The French will know that losing out to Australia was a tough one, a loss that will hamper their ability to finish as high in the group as they would like. China suffered a massive loss but it was a loss to the best basketball team in the world, and they know that every task will be more straightforward from this point on. 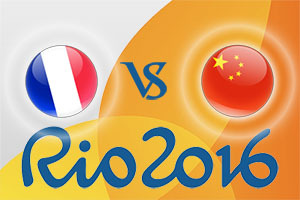 The French are likely to win this game well, so it should see them ease back into contention in the group. Tony Parker was the leading man for the French in that opening game as he managed to deliver 18 points against the Australians. The French will be smarting from that loss but they know they have a great chance to get things back on track with this game and they should take control early on. The Chinese will be thankful about having got their match against the USA out of the way but it was a special occasion for the players, particularly Yi Jianlian. With well over 200 games in the NBA in his career, Yi Jianlian has shown he has what it takes to compete at the highest level and his 25 points against the US certainly grabbed the player a few headlines around the world. He’ll be keen to show that the performance was no fluke, which means the French will have to watch out for him in this game. The basketball betting sites are backing the French to win big in this game and you can back the French at -24.5, at odds of 1.90. If you have an interest in the Over/Under market, you should look to go UNDER 149.0 which you can find at odds of 1.90. Bet Now! There are a few Prop bets on offer for this game in Rio. If you are looking for a French half-time, French full-time bet, you will find the odds at 1.083. If you think the French will not be as convincing as many expect, you can back France to win with a margin of 10-13 points at odds of 8.00. A French win by 17-20 points is on offer at odds of 5.00. The standard Odd or Even bets are also available in this game. This game starts at 0230 BST on Tuesday the 9th of August.